Love Thanksgiving? What a perfect theme to incorporate into your wedding! It’s a season of love and food! There are ways to add that homey holiday flare without constructing some form of a paper turkey. Especially if your wedding day happens to “fall” right on the holiday weekend!. For your table settings think harvest theme, use thanksgiving inspired ingredients in a fresh way for your menu, while expressing thanks to your loved ones in a number of ways throughout the celebrations. For your table decor don’t be afraid to add multiple elements such as candles, fresh produce, foliage garlands and any other autumn-ish decor items. To add even more of your traditions or to make your guests feel more at home, add touches such as various household items, rugs and comfy furniture. For venue spaces, nothing says the holidays like a family home or a rustic barn space. You can also use an outdoor space (weather pending). Adding area rugs to your aisle can also add warmth and compliment your colour palette. Bring your furry friends, having the family dog be part of the wedding couldn’t make it feel anymore like you’re at home on the holidays. For entertainment, you can always go with a traditional band or DJ. However, if you do have any musical talent in the family add them into the mix and bring that personal touch to your special day while making it really feel like the holidays. Now for cocktail hour, the fall season brings plenty of options for drinks and desserts! For beverages you can do a seasonal punch or even a mulled cider which is delicious served hot or cold. 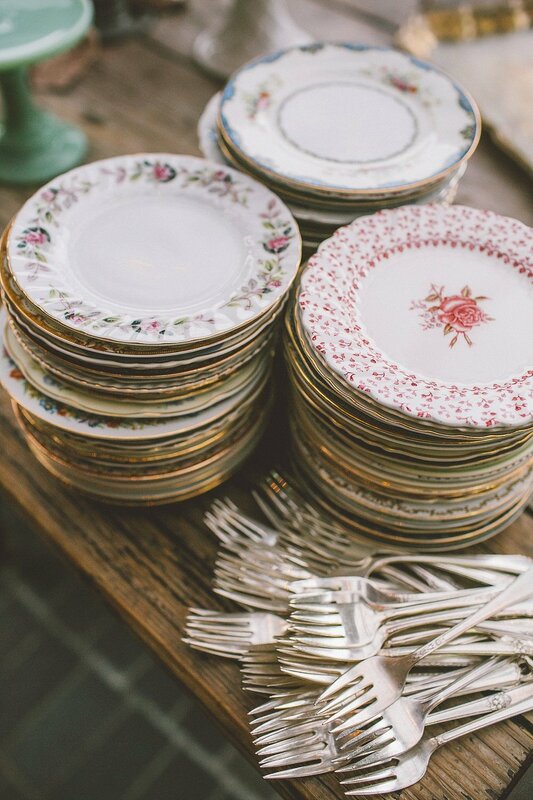 For an eclectic flare, use mismatched plates and serve ware to add more rustic charm and family tradition to your place settings. Even using some of your family’s china will bring a personal touch. Rental companies also offer great options for this style. Other than a traditional wedding cake/cupcakes , there is one other dessert alternative that we love to indulge during the holidays… PIE. Some brides have even had a specific pie station with multiple classic flavours. But don’t forget about our good autumn friend the apple, there are so many options. The most popular is an apple dipping table for guests to have fun and create their own take home snack! Leave us a comment on ways you included Thanksgiving into your wedding day, we'd love to hear! Follow us on Instagram and Facebook for more wedding inspiration and behind the scenes bridal store moments! Still searching for that perfect wedding gown? Book your experience with us today!